I read this book quite some time ago and once again I left it in the “too hard’ pile to review. It isn’t a great book, but it also isn’t a bad book. I understand the great appeal of Liane Moriarty but I also sometimes think that her books are too hyped up and this can sometimes leave the reader feeling disappointed. Aside from this, I imagine that Liane Moriarty would be an absolutely delightful person to hang out with because she is a great observer. Her characters are always are well-described and you feel very comfortable hanging out with Moriarty’s characters because you either see yourself as one of them or you know people like them. She gives her characters nicknames and don’t we all do that in real life. Once again Moriarty has created an assorted crew of characters and has sent them off to a health retreat. Of course, being a Moriarty novel nothing goes to plan and this novel takes an unexpected turn that I don’t think anyone could have predicted. The plot twist is quite outlandish and I don’t believe Moriarty necessarily needed to go in this direction with this book, but hey she can do whatever she wants with her writing. The story wasn’t to my liking, but what I did like was the brilliant characters who made me laugh uproariously. I also loved the ending. I love how Moriarty ties everything together. As I said, I may not have completely loved the plot, but I do like the way Moriarty creates characters. Following the events of The Dark Days Club (2016), Lady Helen is back and she’s slowly coming to terms with her new life. I like this book better than the first book. I enjoyed the historical aspect of the novel and I also felt that Goodman was able to fully develop the characters and the story. I felt that after reading this book, I had a better grasp of both the regency and fantasy world. Goodman’s books are impeccably researched and her writing is original. Historical fantasy is a difficult genre to pull off but she does so with ease. This book is set in Brighton and Goodman sets the era beautifully. 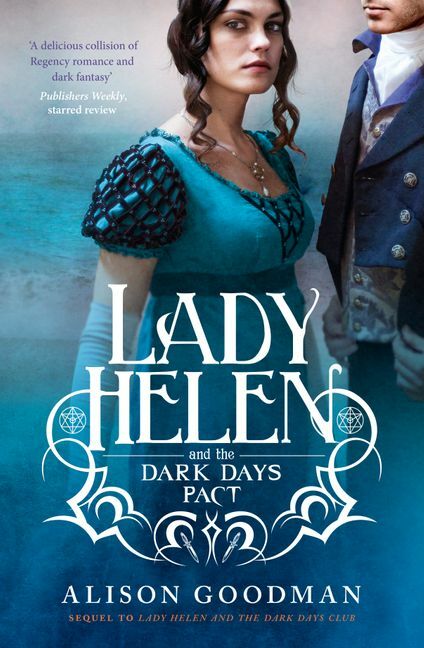 With this second book, the characters are fully formed and we get a real sense of the world that Helen is entering. 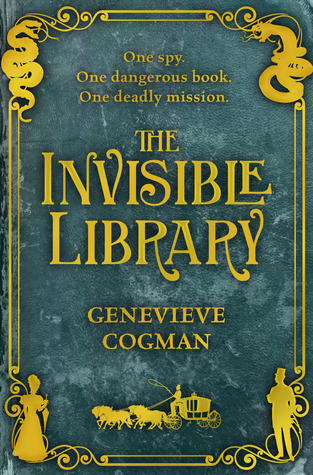 Goodman has created a story that has many layers and she slowly but surely builds the tension and the plot until it reaches its climax which is action-packed. For those that enjoy their romance, there is a love triangle which is deftly written. Helen is a strong female protagonist in a world that favours men. A brilliant book that combines humour, brutality, history and fantasy. I look forward to reading the third and final instalment. 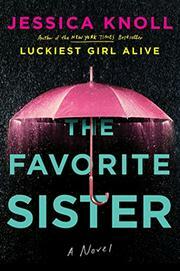 I loved Jessica Knoll’s Luckiest Girl Alive. I found The Favorite Sister harder to get into, even though it was set in the world of reality TV and I have an endless fascination with reality TV. The Favourite Sister is set in New York and the reality TV show is called Goal Diggers. The show centres around women who are all different but who are all out there in the world creating their success and money (unlike the desperate housewives). The women are only invited to come on the show if they are successful business women making a difference. Brett Courtney is the youngest cast member. A beautiful woman in her twenties who doesn’t fit the thin is beautiful mantra. Her success has been built upon the popular WeSPOKE spinning classes, but she is about exercise for health. Brett is gorgeous, rich, successful and a proud lesbian. Stephanie Simmons is the only African-American cast member and a bestselling author. Despite Stephanie’s overwhelming success and her stunning looks, she battles with crippling self-doubt and depression. Jen Greenberg is the authority in juice-bars and veganism. She prides herself on her healthy lifestyle and her thin physique, but secretly Jen craves bacon. Lauren Bunn is a dating website creator. Her app is a must-have and she lives a life of partying and excess. Lauren is known as Lauren Fun! Though, Lauren secretly wishes for a husband and children and a stable lifestyle. Our last cast member is Kelly who is Brett’s sister. Kelly is everything that Brett wishes she was – thin, beautiful and her parents’ favourite. Kelly has a twelve-year-old daughter who is strikingly beautiful and impressive in her own right. Kelly’s demon is her relationship with her sister, Brett, which has been built on resentment and jealousy. Throw in an executive producer, Jesse Barnes, who on the surface appears to fight for women rights but loves it when her “stars” are insecure, fighting or on the brink of a breakdown. Add to the mix showrunner Lisa Griffin who stirs the pot and you have the makings of a sensational story. Add a murder, conniving women, scandals, secrets and snark and you have quite the page-turner. These women play to win and their position on the show isn’t secure. A cast member is bumped at the end of every season and replaced with a new shinier version. At times this book is TOO much and it can be quite exhausting. It is slow to get going and you don’t honestly get to know all the characters in quite the manner that you should and so when the murderer and secrets are revealed you don’t particularly care. Knoll is good at creating drama, but she needs to work on her character building. There was no satisfaction at the end when all was revealed. Though, if you want an entertaining read that’s not too taxing, then this is the book for you. It also provides a fabulously wicked look at the world of reality TV which is anything but real. If you are looking for a fun read, then this is the book for you. All the ingredients are there – the wealthy woman, the handsome husband and the manipulative con-artist. 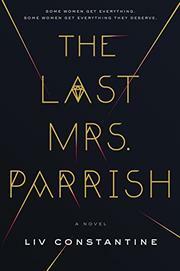 The Last Mrs Parrish is a gripping book that will have you turning the pages. If you read enough books, you will quickly realise that all is not as it seems in this thriller, but still, there are enough twists and turns in this book to keep you entertained. I found it a little too contrived and cliche at the end, but that was just me. I will admit I did find it thoroughly entertaining – lots of melodrama. If you are looking for an amusing and compelling book for pure entertainment, then look no further. Irene Winters, an interdimensional Librarian seeking rare books across alternate worlds – hooked, yeah so was I! What a great premise for a book. I’ve read lots of reviews on this book and the majority of people loved it, so why didn’t I share their love? I just felt like Cogman crammed too much into one book and she lost the premise of the book which was fundamentally why I wanted to read this book. Maybe she was worried that she wouldn’t get a second book and wanted to put all her ideas into one book, but this book was TOO much. There were dragons, faeries, librarians, Sherlock Holmes type characters, villains, steampunk, Grimms Fairy Tales, vampires and werewolves…and so much more!! The result was that Cogman lost sight of the story and it was lost in amongst all the hijinks and other stuff. I know she was trying to make it quirky, edgy, different and cool but it didn’t quite work. Though, as I said many have loved this book, so maybe it is just me. So, I think I am all caught up. I know that I have missed some books and next year I will try to be more diligent with my blogging. I hope that someone out there is reading this blog, but I guess for the most part it is a way for me to keep track of what I am reading. Next year I hope to include other stuff besides what I am reading. I have a few ideas and hopefully, they will come to fruition.